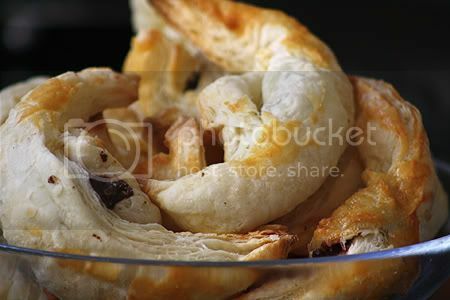 One day, while doing my weekly grocery shopping, I bought a pack of puff pastry in the hopes of making something incredibly tasty for dinner. I was so excited to try out Nigella Lawson’s Chicken Pot Pie recipe because it looked incredibly easy and oh so perfect for a winter-y dinner. So what happened? The Chicken Pot Pie never made it into reality. Laziness kicked in, plus add to that I did not have a baking dish similar to what Nigella used in her recipe. Bummed down and not wanting to forego with what I imagined to be a kitchen disaster if I tried substituting what limited kitchen utensils I have at home, I pulled out the white flag and gave up even before I started. Fast forward to the first month of Spring, and my sister and I were looking for something peckish… something to munch on. 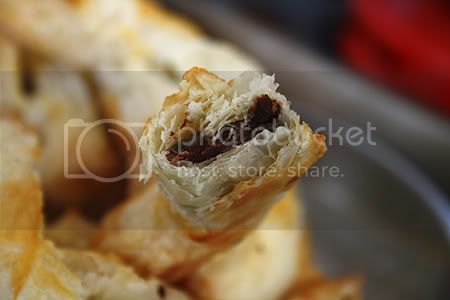 I raided the fridge for ingredients and chanced upon the humble packet of puff pastry in the freezer. Hmmm…. 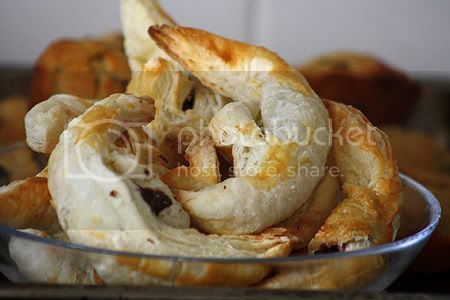 what can I do with a packet of puff pastry and some baking ingredients? … and some spare chocolate bars that I kept hidden away from the hungry eyes of the people in my household because I cherish these chocolates like my own precious. Ok ok I know they’re not true blue croissants (and I know the French will kill me for defaming their much love pastry) but this is a Nigella Lawson recipe and if Miss Lawson calls them that, then who am I to question her? 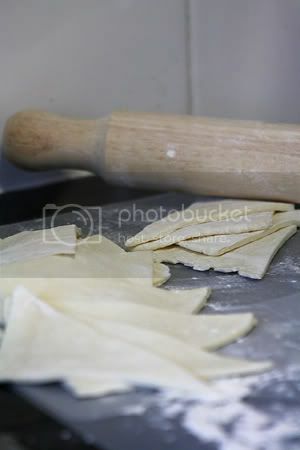 Cut the pastry into small triangles – the size really depends on your preference but I like the small croissants. 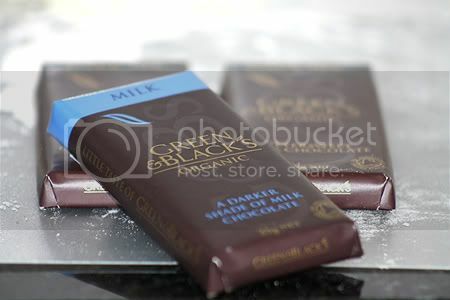 Place a small cube(s) of chocolate in the wide part of the triangle (the side opposite the 90 degree angle). With the wide part facing towards you and the pointy 90 degree end away, roll the pastry with the chocolate cube towards the pointy end. 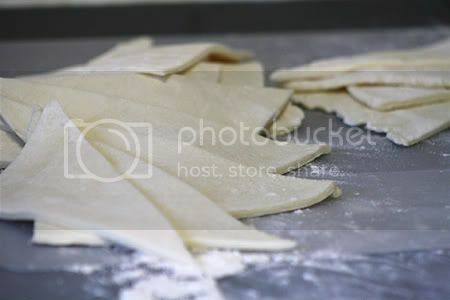 Seal some open edges with your fingers and curl the croissant into a crescent. 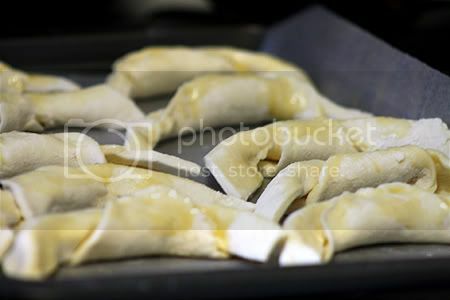 Place on the prepared baking paper, and brush the tops with the egg. You can put a very small dusting of the cinnamon powder and caster sugar if desired. 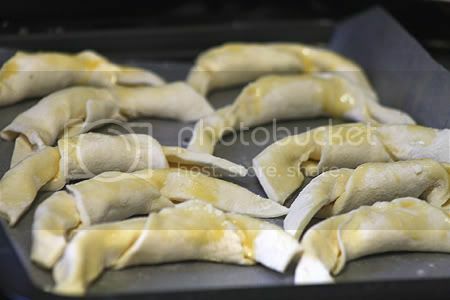 Bake for approximately for 15 to 20 minutes until golden and puffed up. Enjoy with tea! I use short-cut all the time. It’s not lazy… it’s creative and innovative lol!!! Yum! I remember watching Nigella make these on her show, I don’t care if they’re not technically really croissants, they look so good with all that oozy chocolate! After I eat Ellie’s pancakes, Ill have this for breakfast please! oh wicked …there goes my diet ! I have such a weakness for chocolate crossiants. Yum!